Do you have a tiny dog who is always falling into their water bowl? Well, we have a solution for you! People are totally into the DIY, or do it yourself scene right now. So we have an amazing, and easy, DIY water and food bowl setup that you can make right at home. We actually got this idea from Holly over at Our Faux Farmhouse on Instagram. You can find her at @ourfauxfarmhouse. She has a tiny little Shih Tzu, and she always found that whenever he went to go sip from his water bowl his entire face would fall in and he would get all wet. She and her husband do a lot of DIY projects and home renovations so she had her husband make this water and food bowl set up. You can see their project and dog, Milo, below. This project is actually pretty easy so you could probably get it done in half an afternoon. Plus, the water and food bowl is something you will purchase separately so you only need a few additional items. First, you will want to buy a food and water bowl set, as shown in the photo below. Make sure the dog bowl base is made of a material like wood, so you can attach the rest of the project. We found the one pictured below at target.com but you can find other similar ones online and in the pet section in stores. Next you’ll want to pick up a water bottle feeder. Water feeders come in different sizes. The size of your dog will determine the size of the bottle you should buy. 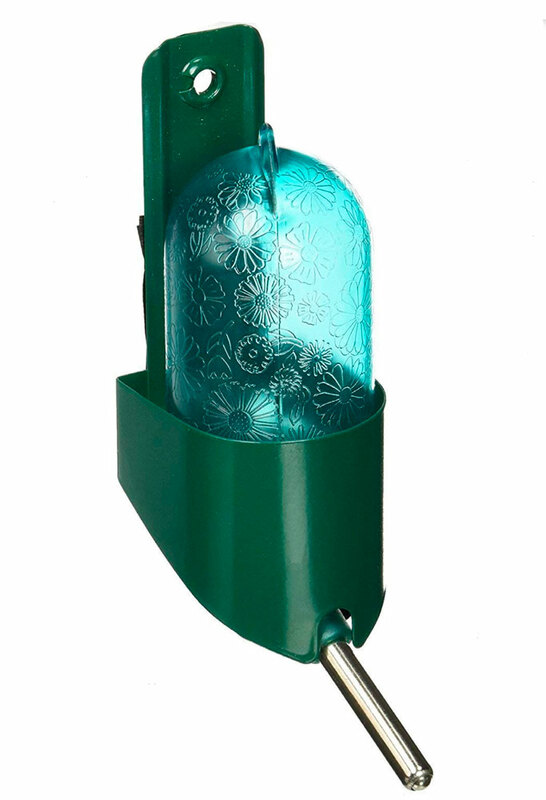 You can find these bottles in the “small pet” section in your local pet store and online. They are actually commonly used for hamsters and bunnies. You can search “water bottle feeder” or “small pet feeder” to find a variety of options online. They have plain bottles and ones with cute designs, like the one Holly used. You can choose to get a bottle that already has a holder too. A bottle that comes with a holder will make your DIY process that much easier, because you can just attach the holder instead of finding a way to attach the bottle by itself. We found the bottle pictured below on Amazon. Lastly, you will want to pick up a piece of MDF wood or real wood from your local home improvement store. Measure the length of your dog bowl set that you purchase and get a piece of wood that is the same width. Depending on the height of your dog will determine the height of your piece of wood. Measure your dog from his paws on the floor up to his mouth and then that way you can determine the overall height of the piece of wood and where your bottle placement will be. Simply secure the piece of MDF or wood to the base of your dog bowl set by using some wood glue and wood nails. You can then paint the piece of wood or MDF to match your home decor, water bottle, or bowl set. If you choose a water bottle that does not come with a holder, you can simply secure the water bottle onto the piece of wood by using a heavy duty Command strip or you can create your own holder by using a couple brackets from your home improvement store. 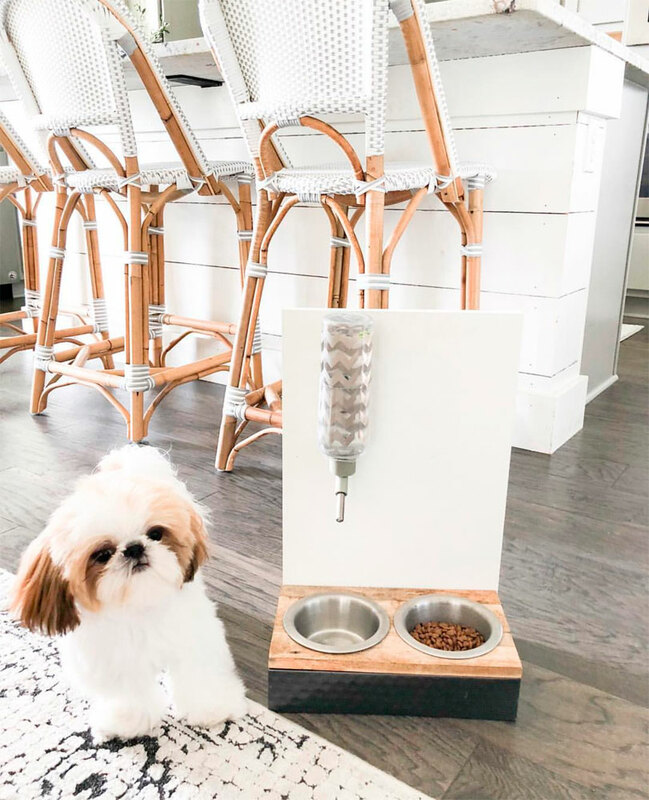 The extra water bowl that will sit beneath the water bottle feeder will actually be a great spot to either put treats for your dog or it can be used to collect drips from the water bottle.